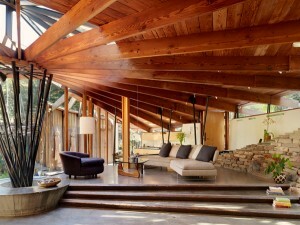 Vivian Dwyer of Dwyer Design has a tremendous wonderful timber house of all time. It is a wonderful wood wonder with nature in almost every turn and twist. The house is originally built in 1960 by Daniel Liebermann where the apprentice with the Frank Lloyd Wright at Taliesin West. The sweet timber home design occupies 1000 square feet. The Radius house here was redesigned by Dwyer with the goal of inserting modern elements into a down to earthy home. The house concept is a circular floor plan with living areas radiating outward. The renovation involved in redesigning kitchen, refurbished concrete floors, wood beams, metal pipes and exposed brick walls covered in a cool clean plaster. On the rear of the home you will find the master bedroom and bathing area combination. The earthy luxury isn’t complete until the exquisite stone fire place is installed. Each rooms found at this natural home offers you with a breathtaking views of giant redwood forest outdoors. Please contact Dwyer Design architect if you needed further information.